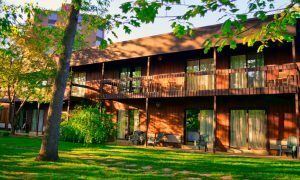 Deluxe rooms offer balcony views of the Laurel Run stream, making this the perfect place to spend a quiet evening away. With close proximity to the indoor pool, you’ll always find great ways to relax and rejuvenate. These deluxe accommodations feature two full size beds and a balcony. 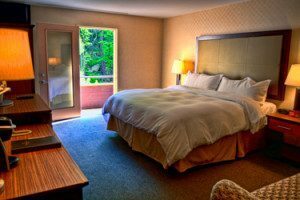 Each room features a refrigerator and microwave flat screen television with cable TV, pay-per view movies, complimentary Wi-Fi access, hair dryer, iron & ironing board, and two complimentary bottles of water upon arrival. Enjoy a cup of fresh brewed coffee with an in-room Keurig coffee maker. Enjoy the extra-large vanity space and rain shower head. The bathroom is contemporary and features a rain shower head and tub. 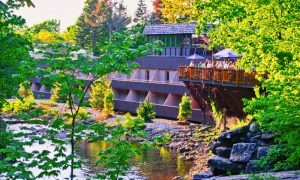 Rooms can be entered through the streamside entrance and are located on ground level near the pool, fitness room and spa. Whether you need to prepare for that business presentation, iron your tuxedo, or dress for the big gala, The Woodlands’ Streamside Room has plenty of space to fit your lifestyle. Plus, you can always take a moment to relax and enjoy the amazing views of the Laurel Run Stream from your balcony. These deluxe accommodations feature one king-size bed and a balcony. Each room feature a refrigerator and microwave, flat screen television with cable TV, pay-per view movies, complimentary Wi-Fi access, hair dryer, iron & ironing board, and two complimentary bottles of water upon arrival. Enjoy a cup of fresh brewed coffee with an in-room Keurig coffee maker. Enjoy the extra-large vanity space and rain shower head. The bathroom is contemporary and offers a walk in shower.Rooms can be entered through the streamside entrance are on ground level nearby to the pool, fitness area and spa. 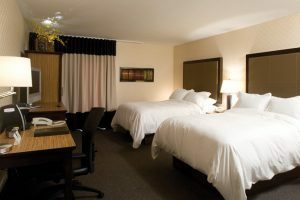 Choose a room with a king sized bed for a fun weekend with someone special, or a room with two double beds for the perfect night out with friends! With balconies and patios featured in select rooms, ensure you never miss a beat as you overlook the pool and courtyard areas. 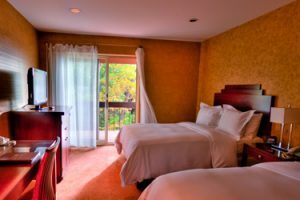 Boutique cozy rooms offer white down Belgian linens to ensure a comfortable night sleep. 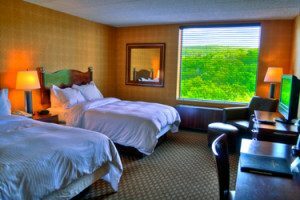 Each room features a flat screen television with cable, pay-per view movies, complimentary Wi-Fi access, charging port for all your Wi-Fi devices, hair dryer, iron & ironing board, and two complimentary bottles of water upon arrival. Enjoy a cup of fresh brewed coffee with an in-room Keurig coffee maker. The bathroom is contemporary and offers a walk-in shower. The rooms are available on the first or second floor. There is not elevator access but luggage assistance is available if needed. Some rooms come equipped with a refrigerator and microwave. 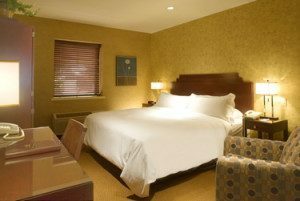 Boutique cozy rooms offer white down Belgian linens to ensure a comfortable night sleep. The beds are two full sized doubles and offer a balcony or patio overlooking the tranquil, wooded inner courtyard.Each room features a flat screen television with cable TV, pay-per view movies, complimentary Wi-Fi access, charging port for all your Wi-Fi devices, hair dryer, iron & ironing board, and two complimentary bottles of water upon arrival. Enjoy a cup of fresh brewed coffee with an in-room Keurig coffee maker. The bathroom is contemporary and offers a walk in shower. The rooms are available on the first or second floor. There is not elevator access but luggage assistance is available if needed. All rooms come equipped with a refrigerator and microwave. Spend the night in our tower section for a relaxing evening away from the hustle and bustle of your everyday life. Easy Access off of the front desk lobby with elevator access. Contemporary styled accommodations offering white down Belgian linens to ensure a comfortable night sleep. The beds are two full sized doubles and offering larger closet space. 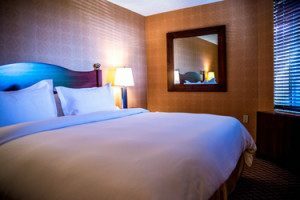 Each room features a flat screen television with cable, pay-per view movies, complimentary Wi-Fi access, charging port for all your Wi-Fi devices, hair dryer, iron & ironing board, and two complimentary bottles of water upon arrival. Enjoy a cup of fresh brewed coffee with an in-room Keurig coffee maker. 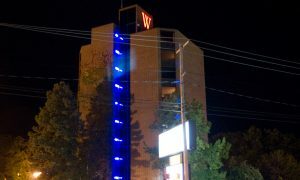 The rooms are accessible via elevator off the front desk lobby. The area is very private with 4 or 6 rooms on each floor. ing board, and two complimentary bottles of water upon arrival. Enjoy a cup of fresh brewed coffee with an in-room Keurig coffee maker. The bathroom is contemporary and offers a walk-in shower.